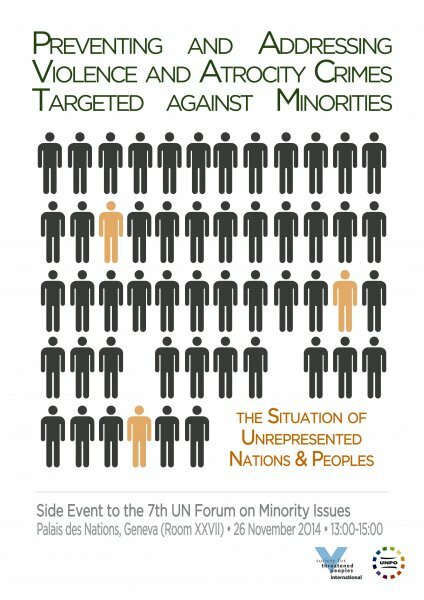 The Unrepresented Nations and Peoples Organization (UNPO), in tandem with the Society for Threatened Peoples, will conduct a side event to the 7th UN Forum on Minority Issues in Geneva on 26th November 2014. The event aims to draw attention to the violent crimes endured by different minority groups, who lack proper representation. In the past year in particular, minority groups and indigenous people have been forced to suffer widespread, systematic violations of their basic human rights, including massacres, mass displacement, sexual violence, enforced disappearances and extrajudicial killings. Some of the offences constitute war crimes or even crimes against humanity. The rise of the Islamic State and their targeting of ethnic and religious minorities in northern Iraq has drawn particular attention to this issue, but it remains an unfortunate reality for many more minority groups from all over the world.